Our mission is to create an all-natural cure for jet lag for your trip. We do this by integrating your personal profile with your entire flight schedules along with leveraging applied research in chronobiology (the study of body clocks). If this is your first time here (and especially if you are worried about the debilitating effects of jet lag), we know all the information you think you need to learn about jet lag can be overwhelming. So we’ve created this page, with some of our best resources, to get you started on the road to a more productive and enjoyable trip. Sarah Spagnolo from Travel+Leisure discusses the major influences on jet lag with Katie Couric and how Stop Jet Lag uses them to make your trip more productive and enjoyable. The computer software that creates your Stop Jet Lag Plan was developed by Bill Ashton in collaboration with one of chronobiology’s preeminent scientists, Dr. Charles Ehret. Unlike other solutions, Stop Jet Lag leverages and integrates personal profiles, flight schedules, and applied research in chronobiology, providing travelers with the most comprehensive and accurate means of beating jet lag, even for those with difficult flight times or complex multi-stop itineraries. The team’s specialized software allows Stop Jet Lag to determine the best jet lag avoidance scenario for any flight schedule. The result is a customized Stop Jet Lag plan that takes into account the particular details of each trip, as well as the traveler’s personal habits. This makes it possible to identify times during a travel itinerary when ‘core sleep’ may be possible and prescribe specifically timed activities to optimize that sleep schedule. 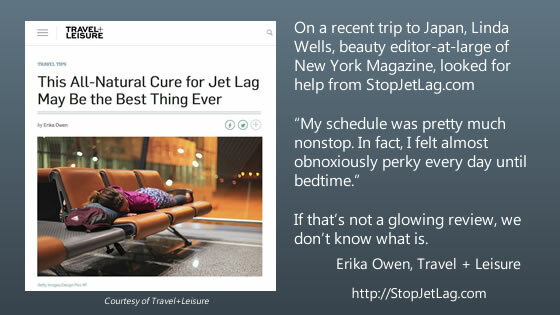 "Why I realized the need for Stop Jet Lag"
"All of my challenging travel experiences convinced me to create a comprehensive Stop Jet Lag service to help other travelers on their long distance business trips now that proven scientific research can be used to beat jet lag." "Why I became involved with Stop Jet Lag"
"The program is able to identify and then select the optimum times during the schedule when ‘core sleep’ may be possible and then keys the rest of the prescribed routine to that optimum sleep schedule." Why is Stop Jet Lag so effective? Stop Jet Lag is consistently effective because it coordinates the specific timings of the major natural jet lag influences with the personal sleeping and eating habits of the traveler. The major benefit of the StopJetLag Mobile apps is how they give you notifications about when to follow the all‐naturalcues while you are busy immersed in your travels. Mobile apps make using Stop Jet Lag even more convenient. 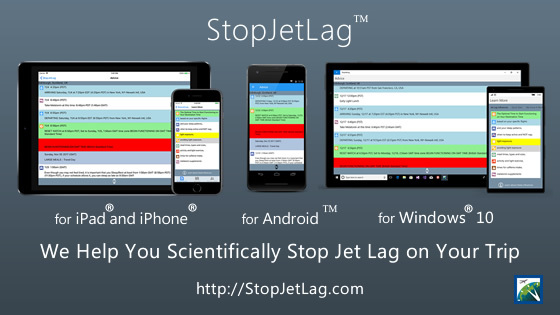 StopJetLag™ Mobile Apps available for iPhone®, iPad®, Android™, and Windows® 10.